What techniques can be used to differentiate between correlation and causation? Psychology is unique among other medical sciences in that it cannot ask test participants to like, prefer or support something. As such a vast body of psychological studies are purely observational and can find correlation but not causation. For example if there is a link between self-awareness and empathy, how to test if being more empathetic increases self-awareness, being more self-aware increases empathy, or, let's say, level of some hormone control both and they are otherwise independent of each other? A study found that people who eat a lot of sugar are fat. How researchers can test whether a) eating sugar makes people fat b) being fat makes people eat more sugar or c) both sugar consumption and body fat are influenced by the same external factor? A study found that people who like yellow color are more likely to be psychopaths. How researchers can test whether a) liking yellow turns people into psychopaths b) being a psychopath makes people like yellow c) being a psychopath and liking yellow are both influenced by the same external factor? In first scenario the answer is easy - split test subjects into two groups, force one group to restrict sugar intake and monitor their weight, help second group lose weight and monitor their sugar intake. In second - I cannot find the answer. Because psychology generally concerns itself with what people are as opposed to what they do, the standard approach in medicine described above cannot be utilized. Researchers can't force someone to like yellow, neither can they turn someone into a psychopath. When researchers find a statistical correlation between character traits or preferences, how do they test whether there is a causal relationship between those characteristic, if traits cannot be adjusted? There is no statistical test for distinguishing mere correlation from causation. It has to come from ulterior (model) considerations. Having said that, a common way is to design a new experiment, called a controlled study, in which [based on ulterior model considerations] you change something in some but not all the items/subjects observed. This is basically what you describe (propose to do) in your situation 1. If you have no way whatsoever to change/adjust anything, then you are stuck so to speak; there's no way to go beyond observational studies. In practice, researchers come up with an idea of what causes what and try to "eliminate" (or rather account for) confounders--what you call an "external factor". There are various degrees of statistical sophistication at which you can do this, e.g. the so called path analysis. However, coming up with a complete list of confounders is hopeless. 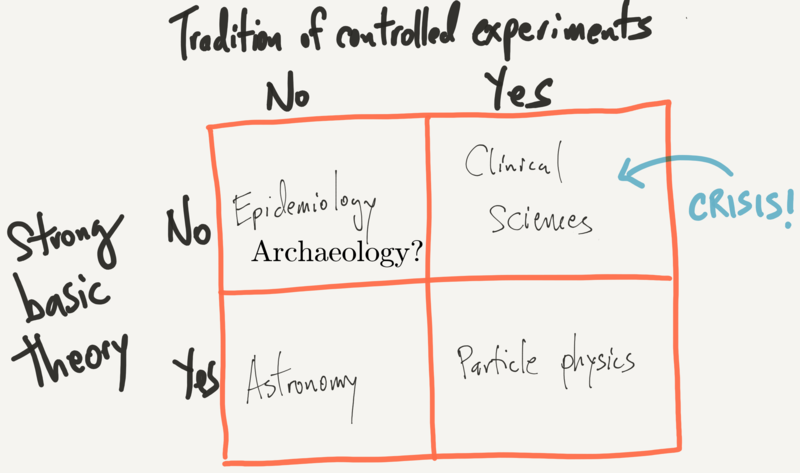 But Peng also describes his own field, epidemiology, in the top left of the chart, as having largely been spared the reproducibility crisis, even though it is as theoretically rudderless as medicine or psychology (or archaeology). His contention is that in fields that rely on experimentation, breeds an unreasonable expectation that the results of single experiments (if well-designed and statistically validated) are true. Meanwhile, observational sciences, which are accustomed to the fact that they have little control over their observations and that single results may well be wrong, have already learned the core lesson of the reproducibility crisis: don’t trust that that isn’t replicated. In fact some of the most controversial results in psychology have both a theoretical (albeit not deeply so) basis and rely on controlled rather that observational studies, e.g. the ego depletion hypothesis, which is roughly that sugar restores willpower. As long as you're able to observe the phenomena you're attempting to ascertain causality separated in time, you can test whether the forerunning phenomenon is a good statistical forecast of the subsequent phenomenon. Whether we fully understand the mechanics of how the former causes the latter or not is immaterial to them being in a causal relation, and, in fact, any such explanation is just a breakdown of one such lagged correlation into a series of correlations between intervening steps. Not the answer you're looking for? Browse other questions tagged measurement or ask your own question. What is the difference between IQ and Executive Function? What is the difference between facets and factors? What are the correlation between the Big 5 (OCEAN) dimensions of personality? What are the methodological differences between a ‘constructed’ and a ‘standardized’ psychological test?